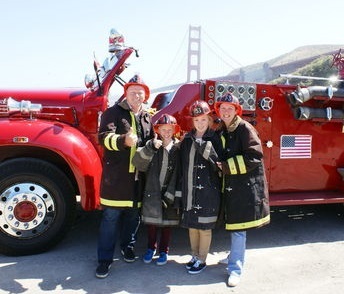 Enjoy riding high on our 75 minute tours over The Golden Gate Bridge. Even if you’ve seen these sights before, this is a whole new experience on our open air fire trucks. 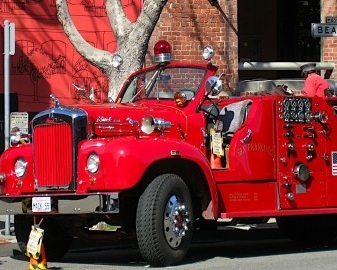 Experience San Francisco and its iconic sights on board a vintage fire truck. On the 75-minute excursion you will start out from Fisherman’s Wharf and then travel the city’s streets, across the Golden Gate Bridge and to the village of Sausalito across the Bay. 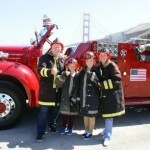 Wear authentic fire gear to wear to keep warm on the Shiny Red 1955 Mack Fire Truck. The vehicle seats only 14 passengers, ensuring that the tour is a personalized experience. On your narrated tour you’ll head from Fisherman’s Wharf to the Presidio, and then pass Fort Point at the base of the Golden Gate Bridge. Then cross the bridge and travel to Sausalito, a jewel of a town that boasts magnificent views of San Francisco across the Bay. Stop for photos at Fort Baker and then cross back over the Golden Gate Bridge, making your way through the lovely Union Street neighborhood and return to your starting point at the Cannery.